When I first found out I was pregnant, I knew that I really didn't want to invest a lot into maternity clothing. So I set to making myself a list of basics that I could integrate into my existing wardrobe and make my clothes last as long as possible. I added a couple of things as time went on but here's my "core wardrobe" - the pieces I wear regularly and that can help turn something non-maternity into a stylish maternity option. 1) First up was black and white tanktops. I got mine from Motherhood.com and they came in a two pack - one black and one white. (here) These have been my most worn maternity clothes. I wear them under blouses and dresses to "smooth out" my bump or just by themselves around the house and at night. I ended up going back for a second pack so I have 2 black and 2 white. 2) Black and white leggings. I wear a lot of leggings, so I knew I wanted some that would fit my growing bump. I got these from Motherhood.com as well (here) though the white ones I had to find in the store. The thing about maternity leggings is sometimes they have the weirdest seams or the fabric isn't soft or it's too tight or too loose. These are perfect. Comfortable enough to wear around all day long, thick enough not to be see through, and light enough for any temperature below 75. A must-have. 3) Two maxi dresses - one in a solid color that you love, and the other in a fun pattern. These don't have to be maternity items. I got my solid color maxi dress at a thrift store for about $6, and my printed maxi dress from Old Navy for $15 (on sale). The solid color maxi was Liz Lange from Target and I found that you have to have a bump to make it work because I'm 5'4 and the length in the front would be too long without it. 4) Chambray dress. I'm lucky - I found this item at a thrift store for about $4. Mine is from H&M Mama, and is short sleeve. You can mix this one up with a variety of belts, leggings, and shoes. The look is totally different with a pink belt and flip flops than it is with leather boots, belt and a scarf. That kind of diversity with your existing accessories is a must! 5) A striped shirt. Stripes do something fun to the baby belly and I enjoy wearing a good striped shirt. I went for thin stripes because bigger ones make my already huge bust a little over the top. I picked black and white, and I pair it with anything from a black maxi skirt and jean jacket to blue jeans and flats. 6) A solid color shirt. I got a pink one in a two-pack from Motherhood.com (here) - Can you tell I love the two-packs? This can be paired with just about anything, and I find just a couple of maternity shirts are essential for the days when you try on a number of things and "nothing fits" - You always have a fall back option! 7) Maternity shorts. Being summer, shorts are necessary. I am not a big fan of jeans, and after my first trimester my hips expanded so fast I couldn't get any of my pre-pregnancy pants over my thighs. I take this as a good sign that my body is "getting ready" but it certainly didn't make it easy to have my hips jump 5 inches in a matter of weeks. I do personally find that I like the "full panel" pants and shorts better because they put less compression on my lower abdomen and are more comfortable (but they also don't stay up as well). When I wear the shorter, tighter elastic waistbands they cause cramping and a foul mood, so I recommend trying on any pants/shorts before buying! 8) Maternity overalls. This one was kind of a surprise to me, but sometimes I really wanted to wear shorts or pants without having a waistband to contend with. Overalls are coming back into style, and they look adorable on pregnant people. So grab the advantage while you can! I bought a pair of Motherhood cropped jean capri overalls, and then found another pair of khaki short overalls while thrifting. Perfect. 9) Not pictured - Black maxi skirt. Find a nice, super comfortable, super stretchy black maxi skirt. You'll be able to pair it with a lot of your non-maternity blouses for a stylish look and because these are usually stretchy anyway it doesn't have to be maternity! So you can wear it after your pregnancy too. Well I hope this list helps someone out there... I feel like maternity clothing is such a racket. You want to look cute while you're growing a baby, but sometimes it can feel like you have to break the bank, especially if it's your first pregnancy and you don't have any friends you can borrow maternity clothes from. This list of "basics" got me through the first 6 months of my pregnancy without issue. After that, maternity clothing becomes more necessary so I really recommend shopping thrift stores, consignment shops, and EBay. Remember that a lot of these clothes were only worn a couple of times before mama had her baby and didn't need them anymore. It's nice to cut down on the environmental impact, as well as the budget! Save it for stuff you really will need - like baby wipes. Hehe. 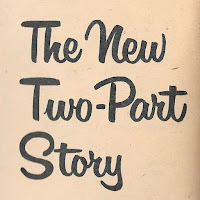 1958 NYT Magazine Swimsuit Spread - The New Two Part Story! So I bought a scanner! 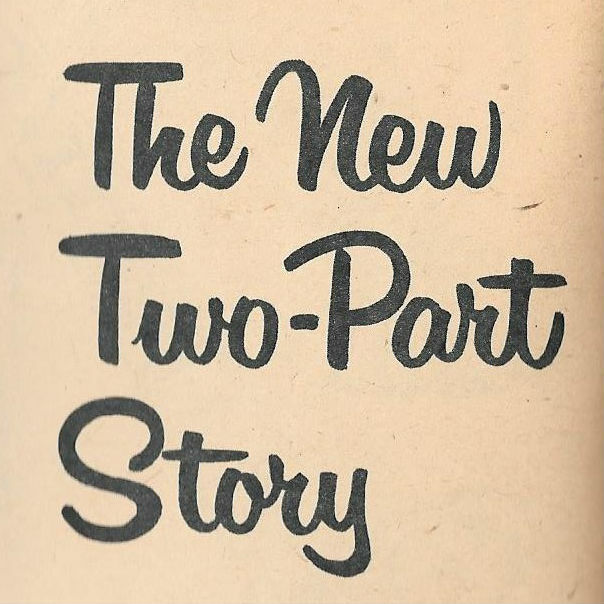 I've really been wanting to scan in some of the wonderful photos I find in vintage magazines (along with some of the funnier ones). 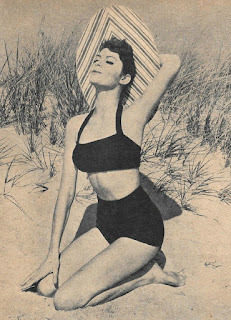 Today, I found a copy of the 1958 November copy of the NYT Magazine, and was instantly attracted by this super swimsuit spread. Here's what 1958 had to say about bikinis: Normal Waistlines may have vanished everywhere else, but on southern beaches this resort season they are not only back but also bare. Not for a decade have so many two piece bathing suits been seen. More daring types may even try the Bikini for maximum exposure to the sun. 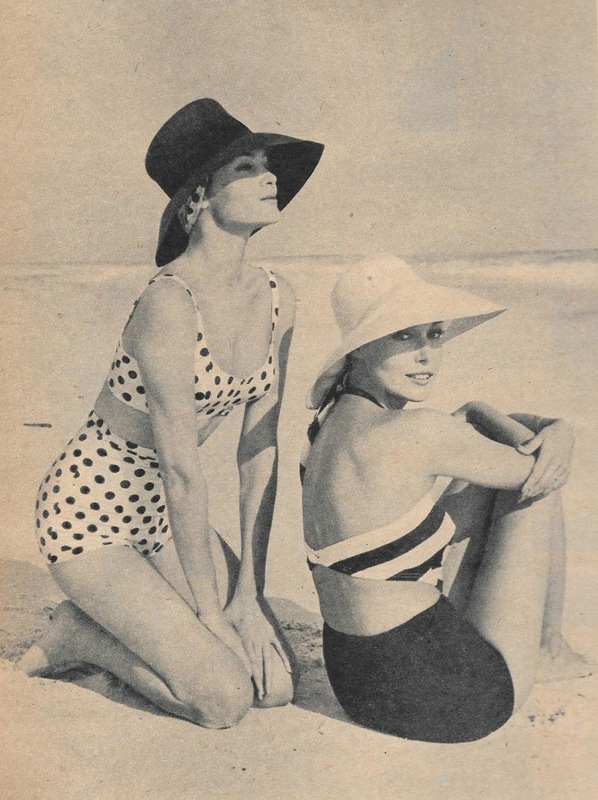 With these brief swim suits go hats almost as big as parasols. (about the polka dot suit) A classically cut, body-molding suit for free-style swimmers has a bit of dash added by dots. This is black on white in cotton and lastex knit. By Elizabeth Stewart. $20 at Saks Fifth Avenue. The shiny licorice straw hat by John Frederics. (about the stripe suit) The midriff plays peek-a-boo here - covered in the center front by a striped triangular piece hooked onto the briefs. A detachable strap loops around the neck. In black and white lastex wool knit. By Rudi Gernreich for Westwood. $23 at Lord & Taylor. A large dose of sun is prescribed for this suit. The top is almost pure Empire, cut straight across the front above and below a rounded bosom. Hand-loomed wool and Helanca nylon of a rich green shade, with blue and white stripes. By Margaret Pennington. $30. Available exclusively at Bonwit Teller. 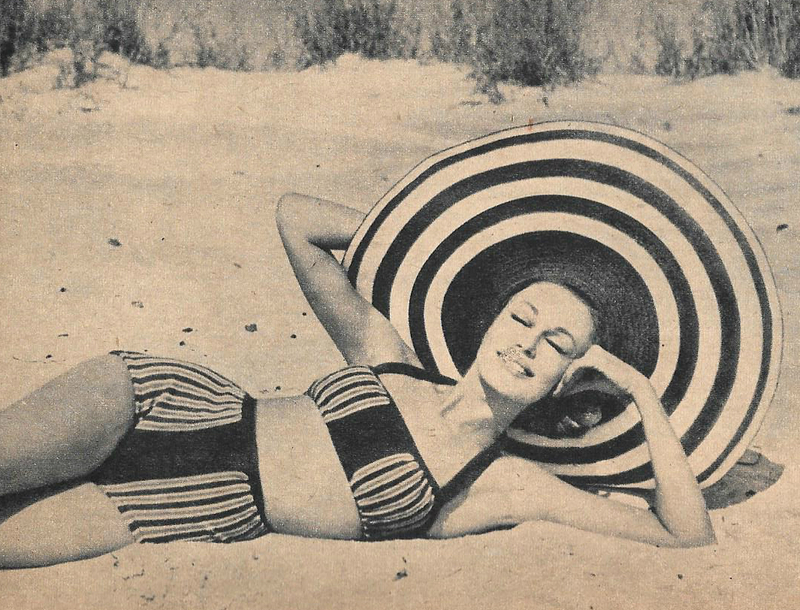 The enormous, floppy straw sunshade hat by John Frederics. The basic black uniform in every woman's resort wardrobe, with this season's difference - cut in two to reveal the middle. Bandeau around the bust is gently shirred for subtle fullness. In hand-loomed wool and Helanca nylon. By Margaret Pennington. This is $30 at Bonwit Teller. Striped hat in red and white denim is a Sally Victor design. 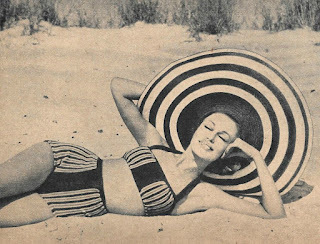 For the more adventurous soul, a Bikini, seen up to now mostly on European shores. This miniscule amount of cotton is printed with a giant Paisley pattern: purple, green and red on white. There is a "surf ruffle" all the way around the hips. By Jeanne Campbell for Sportwhirl. $12 at Arnold Constable after Jan 15.